DIY diary - window repairs are a pane! The Beatles sang their hearts out about fixing a leak where the rain gets in, and how it stopped their minds from wandering. I spent several hours the other Saturday doing just that - fixing leaking windows which have been letting in water in increasing quantities. It started with a steady dribble from the back porthole on the starboard side, which I resolved by removing and re siliconing it just before the winter set in. The results were immediate and not a drop has reached the rammakin dish placed strategically beneath it. Sadly, leaking windows seem to be contagous, because no sooner had I fixed the one at the back than the two big windows in the starboard side of the saloon started to erupt. The second one back was so bad that I would arrive to find a veritable river delta accumulating, running back to pond next to the loo. Then the front one started up, saturating the curtains which started to go mouldy. Time for serious action. I feel a bit guilty because I took a short cut when repainting the boat, and didn't take the windows out. I thought is would be a huge job and was nervous of undertaking such a destructive act on the boat. I was worried that if I touched them they might start to leak! Top Tip - take windows out when you repaint a boat - it's short sighted not to. The point of ingress wasn't obvious, so I desided to take direct action by completely removing the frames, painting round the openings (like I should have three years ago) and then bed them back into a thick layer of silicone sealant. In the event this proved to be a remarkably straight forward job, with the windows unscrewed on on the bank within 45 mins, and after a coat of paint, they were back in place before I left WB three hours later. One small snag is breaking them out of their old silicone beds. I prized them out using a large flat screwdriver which was effective, but I did bend the aluminuum frames in places. No matter, the Cauldwell windows are robust and a few taps with a light hammer restored them to their former shape. The one thing that continues to puzzle me is why three out of four windows on the starboard side have all failed, but none of the port. It could be that the fitter has a bad hair day when he worked on that side, but I wonder if it may be attributable to the fact that the starboard side normally faces south, and therefore is more prone to expansion and contraction in the sun? It wouldn't surprise me if the boat changes shape at a different rate to the glazed windows and, over time, if this slight differential movement breaks the seals? Does anyone out there have any insight into such matters? Anyway, whilst I was waiting for the paint to dry I fitted the new cupboard over the basin, and very nice it looks too. The shower room project is way behind schedule, but who cares! So, you see the Beatles were wrong. I did fix a leak where the rain got in but nothing could stop me from wandering - particularly aboard a boat called Wand'ring Bark. I guess that I am just a curious fellow. 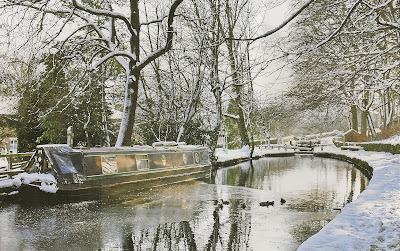 Results of Huddersfield Canal Society's annual photography competiton announced. The Huddersfield Canal Society's quarterly magazine 'Pennine Link' dropped through my letterbox yesterday. The HNC's magazine is always something to behold, a small circulation publication which oozes quality, reflecting the love they have for their newly restored Canal. A few months back they asked for entries to this years photographic competition, and I was tempted to enter a couple of items taken from our trip over the Pennines last Easter. Then realised that they only accepted prints, which all seemed too much hassle. Well their latest Winter 2009 edition contains half A4 sized prints of the winning entries, and I was struck by the winner, taken by John Brierley. His photo of nb Hephzibah at Uppermill in the snow is spectacularly beautiful, especially with the warmth of the early morning sunlight playing across her sides. A little touch of 'ice and fire'. I thought this worthy winner deserved a bit if additional exposure on the Web. Nice one John. My watery wanderings around the lost canals of the Black Country havn't gone unnoticed. 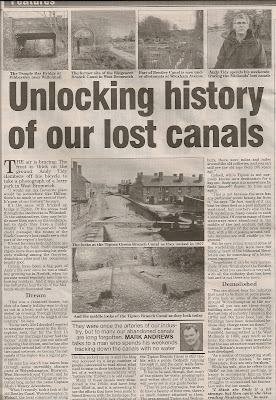 Following the local interest in my look at the Bentley Canal I was interviewed by Mark Andrews of the Wolverhampton Express and Star, who started with the observation - "Why do you visit these places - they arn't exactly beautiful?" Of course he is right, the areas are rarely beautiful, but they are rich in history. I was rather pleased by his article (published on Thursday Jan 21st) which presented me in a fair and balanced light. It would have been so easy to portray me as a complete fruit cake. Those of you who are regular readers may disagree with that conclusion! I am no Paul on the road to Damascus, but even I have the occasional blinding flash of realisation. The sad thing is that when these moments of insightful illumination come along, and I share my new perspective with those around me, my bubble is usually pricked. Others tend to point out that far from residing in the intellectual valley way below me, that have already passed my new found vantage point and are actually standing of a loftier pinacle than my own. So, at the risk of displaying an alarming gap in my watery knowledge, let me share my latest new found realisation. Most canal historians will know that the northern sections of the BCN were among the last significant canals built, and also the last to remain in commercial operation. I am talking here about offshoots of the Wyrley and Essington Canal like the Cannock Extension Canal (1863) and the Wyrley Bank Branch Canal (1857). The question is, why were they built so long after canal mania had faded away elsewhere? The answer came from my research into the lost canals of the Black Country, and all those hundreds of abandoned mine shafts which litter the maps of the late 1800's. The heavy metal industry of the Black Country was initially powered by the rich coal measures that existed in the area, but the records tell us that by 1850 most of the coal had been extracted and an alternative source was needed to keep those furnace fires burning bright. Whilst a hundred years before the industry would have upped and moved to the the new coalfields, the Black Country infrastructure was by then set in place and the coal needed to come to the industry. As coal could still be found in the Cheslyn Hay / Cannock / Brownhills / Norton Canes area to the north of Wolverhampton, and crucially the ground was on the same level, expediency dictated an extension of the lockless canal network to reach these new sources of energy. Simple and obvious really, but not an issue that had ever really occurred to me before. BCN Joey Boats, including a 'Hampton' in the middle. From Pinfolds Bridge circa 1930. The fact that these new coalfields were on a level, and didn't need locks, allowed an outsized 'super narrowboat' called the 'Hampton' class (Wolver-Hampton) to be developed. These large day boats measured 88ft by 7ft 11in and could carry over forty tons of coal, nearly twice that of a standard motor boat. These dimensions were the absolute maximum permitted by the various bridges and corners of the Wolverhampton Level of the BCN. The northern coalfields lasted nearly a century before they too were exhausted, but by then the needs of the industrial area they served had altered and coal was no longer the essential ingredient it once had been. Now I know you will be saying "but that's so obvious Captain", but it wasn't obvious to me! Whilst it's good to have an idea of the canal layouts, the dates of their construction and closure, it's even more important to understand the driving forces behind the changes. So, if like me you didn't appreciate the temporary nature of the Black Country coal mining industry, and the impact this localised energy crisis had on the transport infrastructure, you do now! And if this was somethhing you always knew, you can sit on your lofty intellectual pinnacle with a knowing smile playing across your lips and lob rocks of scorn in my general direction. There I was, minding my own business, doing some jobs on Wand'ring Bark when my mobile started to jangle away in my pocket. It was none other than Mr W, my uber reliable rescue crew, calling me and telling me to turn round. A strange request, as the only thing behind me was the canal . But hey, I would trust the guy with my life so I did as I was asked. Lo and behold I spied two eskimo's aboard a long blue narrowboat, heavily lagged against the frost, waving their arms in a most frenetic manner. A second glance revealed that the larger eskimo had a phone to his ear and his waving seemed to be in time to the laughter coming from my mobile. It was none other than nb The Robber Button, a narrowboat owned by our friends from church coming to it's new mooring at Calf Heath. I knew that a move from Great Haywood was in the offing, but I had no idea that it had progressed from the cunning plan stage, a plan so cunning it could only have come from the university of cunning! What a fantastic surprise! For the time being RB has been berthed in the upper basin, just next to Mrs Miggins pie shoppe, pending a space coming available in the main marina. This may be a slight inconvenience to Mr and Mrs B (yes in this instance there is a Mrs B), but a visit to their craft afforded a particularly fine view of lock number two of the Hatherton Branch canal, complete with it's recycled bottom gates which are at least three feet too tall for the fall. It also lets us take a peek at the dry dock next to the old chamber, currently occupied by a narrowboat having its bottom black(adder)ed. Robber Button, welcome. It's really great to have you as part of the boating community at Calf Heath. Sometimes BW do things so daft that they beggar belief! I first came across BW's bridge signing initiative about two years ago following a rash of laminated signs stuck on wooden posts beside bridges which bore no names or numbers. Now I applaud the plan that, over time, all bridges should carry a name or number. This is a huge help to people unfamiliar with the waterway and great for summoning the emergency services if something goes seriously wrong. What I am not so sure about is the rash of temporary laminated signs nailed to posts beside the offending bridges. Firstly, they are unsightly and secondly, they only seem to last a few weeks before the local lads decide to haul them out and chuck them into the cut. I was pleased to see BW contractors fixing permanent signs to the bridges on the Erewash Canal a couple of years ago, but was surprised to hear blame levelled at boaters who "nick them to stick on their houses". My experience of boaters is that few would stoop to any form of canal vandalism involving prizing historic numbers off bridges. That would be a complete no no, worse even than attempting to overtake! But back to my point about these temporary signs. They crop up in the most unlikely places and the most absurd case I found was to the rear of an isolated bridge on the Hatherton Branch Canal, about 2 miles upstream from the highest navigable point. I was wandering round the rather impressive Cherry Tree Bridge near Cannock and, having risked life and limb to get accross the semi frozen bog for a photo, I was amazed to find a neat little placard proclaiming the bridge name for anyone stupid enough to get in a position to see it! There may be a BW dictate to 'get a name / number on every bridge' but why here? Bonkers. And why was I mooching round the Hatherton Branch Canal? Yes, you have got it.... I was doing a spot of on the ground research for one of my 'lost canals' series. Expect a series of posts in early February. My exploration of the lost canals of Birmingham started with with the help of a series of small maps included within Ray Shill's 'The Birmingham Canal Navigations'. These were ok, but trying to make sense of a small 1790 sketch map covering huge swaithes of the Black Country was a bit difficult. Then I discovered Eric Richardson's booklet 'In Search of the Lost Canals of the Black Country' which included some good hand drawn sketch maps of what he thought used to be present, but they still failed to provide the sort of detail and integrity I was looking for. I finally found my answer in the shape of The Godfrey Edition Old Ordnance Survey Maps. I ordered initially ordered the map covering the Ridgeacre area, which was then the current focus of my research and, wow, what a find. Each map covers an area of about 1.5 square miles or 15 inches to the mile and the detail provided is unsurpassed. What is more, the maps are drawn from 1:2500 originals published between 1885 to 1915, which is the perfect era for canals in their heyday. These old maps highlight every mineshaft, colliery, foundry, tramway and most importantly of all, every canal side arm no matter how small. If you want to get an idea of the area supported by a particular waterway, you can't find a better place to start. The maps are named after their publisher, Alan Godfrey, who has quietly gone about his map business since the 1970's, having previously tried his hand as an actor and playwright. 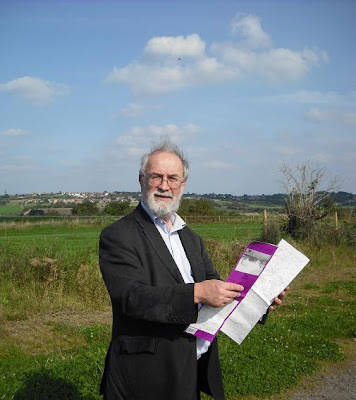 He started by selling second hand OS maps but then developed a niche for reproducing sheets in a slightly altered format, complete with historical notes to add colour to the black and white images. So far Alan and his staff of three in Consett have published about 2,300 maps of urban areas, introducing eight to ten new items per month. No mean feat for such a small team. You would think that sourcing quality original maps is the problem but that isn't the case. The problem is finding local historians to write the commentary and curiously, a shortage of suitable cover photos. This has the feel of a labour of love, a sentiment echoed by Karen Swift who is the local distributor for the Midlands (www.freewebs.com/karenswift13). She has a passion for these maps and explained that she can 'get lost in them for hours'. I can see what she means. So is Alan Godfrey and unsung hero? Well yes and no. His website is quite self effacing with little about the man but a lot about his maps. However, it seems that his commitment to the cause hasn't gone completely unrecognised. He was awarded an MBE for his Services to Heritage in this years New Year Honours List, and well deserved it is too. Alan, you have created something great here and your library of maps deserves a wider audience. Canal hunters and local historians take note. This is a veritable goldmine of information on every sheet, all for the modest sum of £2.25 (plus postage). This time last year I rather unwisely took Wand'ring Bark out for a winter wander with my brother. Not that going our with my brother is an any way unwise - he is a lovely chap! This 2009 trip was during a particularly cold spell and, whilst the marina was well and truly frozen over, the cut seemed clear so we broke our way out. What I hadn't appreciated was the thawing effect of the water running in from the old Hatherton Canal. This flow which represents the bulk of the effluent of Cannock, keeps the junction clear of ice which it was over an inch thick elsewhere and barely penetrable. Hovever, we had started so we had to press on to a winding hole a mile distant, which took the better part of an hour to reach. By the time we got back the bows had been scoured to spotlessly clean steel and the annodes surgically removed as well. This didn't worry me too much as WB was due for reblacking a couple of months later, but I vowed "never again". Roll on Christmas 2009 and once again you find me hurling sticks at a layer of ice and guessing how much there would be on the way to Coven. The small projectiles penetrated the thin film, so I decided to have a crack at it, so to speak. Thankfully another boat beat me to it, breaking a path through the short sections which were iced from bank to bank. In the event the trip was magical, with thin brash ice tinkling from the bows and the hugely entertaining sight of ducks making vain attempts to clamber onto the surface. It looks like we are set for a 'proper' winter this year so I suspect that the newly applied blacking will be in for a bit more punishment before the spring arrives. The Book of Common Prayer encourages us to seek forgiveness for both the things we have done wrong, and for the things we have left undone. I suspect that on the day of reckoning there will be more items on my 'left undone' list than and my 'wrong things done', i'm that kind of a guy. Support aft cooling hose to avoid chaffing - done (but I wish I had done the front one too before it chaffed through on the alternator). Antifreeze density check - done, oh yes - done, I went overboard on that one! Smoke and Carbon Monoxide detectors fitted - done and not done. Life is one long compromise, sifting the important from the urgent and getting ones prorities right. With the BSC approaching I think the outstanding things can wait a while longer while I focus on the things that really matter. Now where did I put that absolutely vital 'Diesel off tap' sign? I have just finished reading The Girl with the Dragon Tattoo and wow, it has to be the best novel is have read this year, or maybe that should read last year, if you know what I mean. From the off it was gripping stuff, a journalistic whodunnit which moved along as a teriffic rate and led me off in completely the wrong direction. I didn't know how it was going to pan out till the very end, and even then I needed the epilogue to make sense of it. 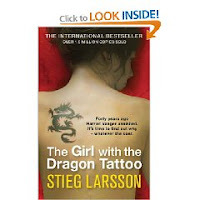 The novel is the first of a trilogy written by Steig Larsson, set in his native Sweeden and translated into English. Sadly, Larsson died in 2004, just after he has delivered his three novels to his publisher and before they were published. He therefore never lived to see the success of his creation. Because the book is set in the world of corporate Sweeden and then translated, some of the places and peoples names are a bit clunky on the tongue. But that does little to detract from an excellent work. The plot is every bit as good as the characters he creates. If you like crime stories, and only have time for a single book in 2010, get a copy of this one. It's a gem. For film buffs, a celluloid version does exist, but is was made and shot in Sweedish and, to the best of my knowledge, has never been screened in the UK. There are rumours of a Hollywood remake, but that is speculation. As you may recall, I recently attended Birmingham's NIA Academy to see Jake and Elwood's Christmas Party back in December, and a lot of fun it was too. Whilst I have attended numerous events at the NIA over the years, I have never experienced it in its 'Academy' format which basically consists of one end being curtained off and used as a smaller auditorium. The idea is as brilliant as it is simple, increasing the flexibility of this huge resource and in doing so becoming one of Birmingham's leading medium sized performance venues. Jake and Elwood did a sterling job, whipping up a partisan crowd into a festive throng but the venue offered them few favours. Mr Fabulous' comment in the original Blues Brothers film "It's a f**king barn. We'll never fill it", is as true of of the NIA Academy as it was of the Palace Hotel Ballroom back in Illinois. The place is indeed, a barn. The back risers are a mile from the stage and the temporary seating on the main floor was numbing the bum within an hour of our arrival. Maybe this had something to do with the crowd's enthusiast to get up an dance. For my money this urge to surge had far more to do with the temperature of the venue. With the thermometer sinking to canal freezing minus 3C outside, the cold seeped in from all sides slowly chilling the audience to the bone. Were it not for the James Brown set, I would have to describe this as the most soulless venue I have visited. If you get a chance to see your favourite artist somewhere else, go there instead. There is a flip side, however. 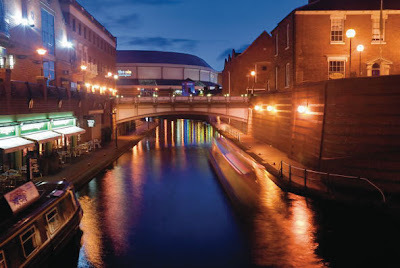 The NIA balcony does offer a vantage point for a truly sublime canal view through Brindley Place towards Gas Street Basin. So, even if the inside of the NIA Academy lacks appeal and intimacy, keep your camera handy to capture some spectacular sights on the way in and out. Having consulted Eric Richardson's Guide and Google Earth, I set off in high hopes of finding some quality remains of this canal, which headed off to the north for nearly a mile from the end of the Ridgeacre Branch. Sadly, my search was largely in vain as the line has had acres of residential houses built on both ends during the six decades that have elapsed since it's closure. Having made one exploration of the area I was aware that the intital section crossing Denbeigh Drive was gone, with the line buried beneath Salop Close. But Google Earth suggested that the canal track might still be found as it skirted the old Hateley Heath School (now an adult education centre) and the adjoining playing fields found at the foot of a high embankment. 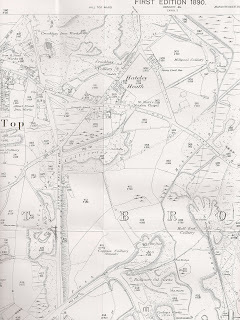 The historical maps of the area tell us that these playing fields occupy the site of Coppice Ciolliery, abandoned in the 1800's, and the higher ground occupied by the canal formed part the curving swiathe of Coles Farm Collieries. In the event the only visible section was the length which ran through the school grounds and then a short distinctively 'canalish' line, squeezing across some waste ground just before Coles Lane. And Coles Lane is where the trail went cold. 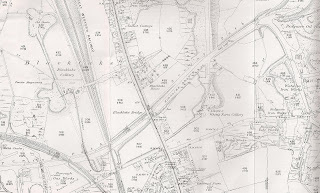 The old maps tell us that the canal followed a line now occupied by Leacroft Grove, complete with three side arms before passing under Witton Lane. Whilst the location of this crossing can be established, there are no visible remains and the final three hundred yards built to reach the Crookhay Iron and Steelworks and the adjacent Crookhay Colliery, now open ground by Moorlands Primary School. The terminus area contained no less than three sizeable basins but sadly all traces of them have gone, covered by Schofield Avenue and James Watt St. So, the Dartmouth Branch Canal turns out to be a bit of a damp squib from a canal hunters perspective. However, as the surrounding mines and foundries had largely been and gone by the turn of the 20th century, this shouldn't be a surprise. If fact, the mining in the area was so extensive that the Hilltop area has sunk by an estimated 20 feet, with disasterous effects on the canal's integrity. But if any of you guys can find some remains at the Balls Hill end please let me know (with photographic evidence). Whilst this route may have had it's limitations, I did end up very close to Balls Hill Basin, which represented the eastern end of the nearby Wednesbury Old Canal, and the start of my next lost canal exploration. The Jesson's Branch is the least of the canals which made up the dense cluster of waterways fanning out from Riders Green Junction. This canal was no more than 400 yards long, branching off the the south of the Halford Branch Canal at Church Lane to reach pitheads which lie beneath the contemporary Ruskin Street, and the Ridgeacre Tubeworks which occupied its western bank. These mines were sunk to reach the thick 'thirty foot' seam of high grade coal which formed the foundation, quite literally, of the Black Country. I can safely say that there are absolutely no visible remains of this short waterway and yet, as is so often the case, it's line is as apparent as the nose on you face, providing you know where to look. I am referring to the canal, not you nose, of course! Having passed under Church Lane you would have found a junction with the Jesson 's Branch with a bridge spanning its entrance, carrying Gladstone St. In 1890 this was no more than an access bridge to the site of an ironworks but was later rebuilt to carry a wider road serving the victorian housing which now occupies the area. The line of the canal is still present in the shape of the car park built to the rear of some new flats, and an inspection along the line reveals that the practice of avoiding the canal line when building has continued all the way to it's terminus at Greswold Street, with the obligatory tramway collecting coal from further afield. This isn't the most illuminating of canal hunts, but I felt it was worth an entry of it's own just for completeness sake. I doubt that many of the residents have any idea that they have unwittingly bought into the canalside living concept. The final half mile of the Halford Branch Canal initially curves round behind a factory, riding atop a substantial embankment which allowed it to cross a small valley in which was clay was found, supplying the nearby brickworks. Before the industrial revolution this area was renown for its open fields, orchards and hunting, but the discovery of coal, iron ore and clay in the vicinity transformed it into an industrial powerhouse. 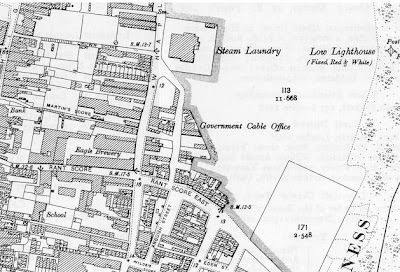 A close look at a map from the late 1800's reveals a myriad of old collieries, slag heaps, iron works, clay pits and brick kilns, with barely an acre left untouched. The canal ran like an artery through the midst of all this endeavour, and without the waterway and it's associated tramways, none of this would have been possible. Access to the canal embankment was possible from Haig Street, which opened out into the grassy public area, previously the Hall End Brickworks. Richardson's sketch of the area suggests the the canal terminated short of Vicarage Road, but an inspection on the ground caused me to believe that it may have continued beyond it, heading north into what is now a housing estate. I hummed and harr'd about the possible continuation, wondering if it could be an abondoned railway line / tramway instead, which has caught me out in the past. However, casting a look back along the road to the Church Lane bridge site, the levels are absolutely spot on, and house builders reluctance to construct on old canal beds gave further credance to the idea. 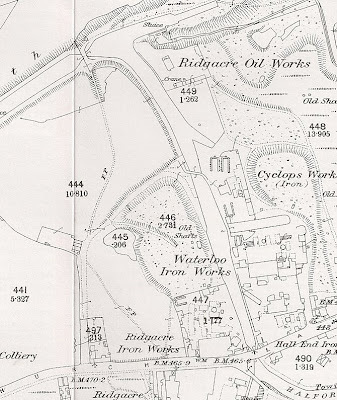 The subsequent purchase of a 1895 Godfrey Edition OS Map at a scale of fifteen inch to the mile confirmed that the Halford Branch did pass beneath the road at this point, terminating in a basin which was served by several tramways from nearby pit shafts. Well, that is it for the Halford Branch Canal. Not a lot to see on the ground today, but considerably more than was apparent on my first exploration. An area which has seen a transformation from rural heaven to undustrial hell, and then back to a more peaceful residential limbo of the modern age. Halfie, if you are looking for a rich inheritance from the canal bearing your family name, I fear you will be both disappointed and penniless! This is in sharp contrast to Joshua Fellows, Managing Director of Fellow Morton and Clayton, who lived in the nearby Churchfields House in the late 1880's. 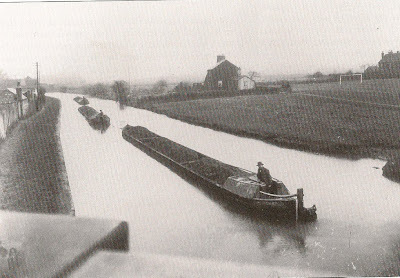 The Halford Branch Canal was a mile or so long, serving as an arm to the Ridgeacre Branch, which was in turn a branch of the Wednesbury Old Canal. The first two or three hundred yards of it's course can be traced running due south from the end of the watered section of the Ridgeacre, which was once the home of a substantial oil works. The canal's path dives into an overgrown cutting before coming to an abrupt end beneath a huge embankment formed by the slag of the nearby iron works, now supporting a partially occupied housing development. The substantial barrier prevents further progess from this direction. A circular detour is now required, finding Church Lane and then the helpfully named Johnson's Bridge Road. 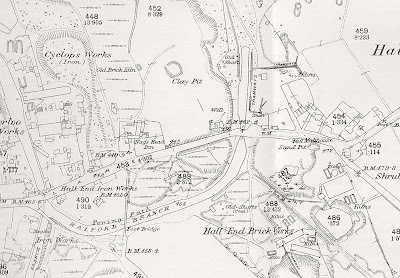 I am not sure if the bridge carrying Church Lane was called Johnson's Bridge, or if this referred to another lost structure which carried the towpath over an inlet to the Cyclops Ironworks (This has subsequently been confirmed by Paul Swift at Johnson's Bridge after the adjacent Johnson's Ironworks which were still operating iin the 1960's). Either way, the Halford Branch will have run beneath the works at the northern end of Johnson's Bridge Road, angling to the west of the highway and making it's way beneath Church Lane, where a distinct rise is still visible, but without any remains of the bridge itself. The hard standing to the south of Church Lane will have been at the level of the canal, and formed a junction where the Jesson's Branch departed beneath what is now Gladstone Street. From Church Lane the Halford Branch Canal curled round the back of what is now a big factory, crossing a valley on a substantial embankment and serving the Hall End Brickworks, which is now open public ground. The presence of housing the factory premises prevented an on the ground inspection, but the line was re acquired in open grassland a little further on. My last visit to the Ridgeacre Branch Canal in West Bromwich was left with some unfinished business. Whilst I thought that I had cylcled the length of the disconnected section, subsequent examinations of the maps and discussions with other bloggers interested in the area revealed the possibility of finding the remains of three further arms, which radiated out from the far end of the Ridgeacre. Eric Richardson's records suggested that the course of the Halford Branch ran off to the south, curling round to a parallel track to serve mines in the area. This arm spawned the Jesson's Branch which struck off south west for about 400 yards. Then there is the longer Dartmouth Branch, running due north for nearly a mile from the Ridgeacre to the Crookhay Ironworks and Colliery at Hill Top. A careful inspection using Google Earth clearly reveals sections of the line, sometimes in the shape of waste land and at other times overlaid with modern road layouts. But for good measure, this entry contains a few images of the end of the watered section of the Ridgeacre (or maybe I should say 'iced') plus the dry line which extends for a further couple of hundred yards atop a spoil heap thrown up from Coppice Colliery. I hope you enjoy this trip into utter obscurity. A Christmas time cruise to the Fox and Anchor at Coven has become something of an annual tradition for the Ahabs, normally accompanied by some friends. This year we ventured forth with our longstanding friends, the Hamstones plus their three children. Their eldest is Jeff's best friend and had spent the night with us so that let us three lads make an early start and check out the ice before the clan set off to join us. Whilst there had been a thaw for a couple of days, there had been a sharp overnight frost and I feared than the canal would have returned to a solid state. A quick trip to Long Molls Bridge near the Four Ashes Chemical Works revealed only a thin crust of ice with maybe a centremetre or so in the marina basin itself. The hoardes were therefore summoned and the stove lit to warm the boat. By the time they arrived at 11.30 am, the sun was out and the rime had melted leaving only a couple of hundred yards of ice to negotiate before reaching the open water in the cut. The problem with ice is that whilst it's ok going forward, turning round 90 degrees is very difficult and it took us a good 10 mins to break an iceberg filled lagoon large enough to point WB's bows at the entrance, much to the amusement of the other boaters present who saw us out with a round of applause! The cut itself was largely ice free, with thin brash appearing as we approached Coven. Our progress was helped by the two boats which had made the passage before us and at no time did the ice present the sort of problem we encountered last January. We winded in the iced up hole by Coven Cruising Club, before returning to a warming round of Hot Chocolates at the Fox and Anchor. This was followed by lunch aboard which included soup and hot dogs wrapped in bacon - very seasonal. With the sun setting into a wintry sky we made out way back but this wasn't without incident. The Hamstones youngest son made a rapid entrance through the front doors and placed a steadying hand flat onto the top of the solid fuel stove! Ouch!. 60 mins of a burnt hand in some ice cold water and a trip to accident and emergency were necessary, but he emerged with nothing more than a sling and a tube of moisteuriser to be applied over the next few days. Three cheers for a mum and an aunt who are both nurses. It is a relief to visit WB after long periods of frost and find that everything was fine. Mind you, I am feeling a bit more nervous about the current freeze up. How much does a new calorifier cost? My festive film viewing was eclectic if nothing else! No sooner had I recovered from Sherlock Holmes that I found myself thrust into the madcap world of St Trinain's, without even an opportunity to view of the original to give it some kind of context. I needn't have worried because this isn't the sort of film that needs a context, just an open mind that anything is possible, if fuelled with sufficient quantities of eostrogen. This is mad cap slapstick with some really funny one liners thrown in for measure. It's the sort of film where you get exactly what you expect, and come away giggling. No depth, no real plot, no real caharacter formation but a whole lot of playing for laughs. For what it's worth, the plot is that the girls return to a 'school with no rules' presided over by an inept Rupert Everett as Headmistress. The baddie, David Tennant, heads a secret society hell bent on recovering some treasure buried away over 400 years ago, and the chase is on between the girls and the women hating baddies. Of course, the girls win after an utterly implausible chase, led on by Talulah Riley (you have got to love that christian name) as a miniskirt and stocking clad head girl, ably supported by an assortment of Emo's, Goths, Bimbo's, Chavs and Nerds. If the sight of Talulah's dark gymslip clad form isn't to your taste they throw in a blond bombshell as bonus eye candy, in the shape of Sarah Harding (Girls Aloud). Between the two of them there is something here for most of the dads! And then there is the brooding Colin Firth, the headmistress' heart throb and go between character, switching sides from the baddies to the birdies. There isn't much more to say really. A feast of stocking clad girls screaming their way to an implausible conclusion. Belle was very taken by the film as it cleared up exactly who Shakespeare was and laid to rest the name of the missing play. It looks like Mrs Shakespeare's "Queen Leer" is going to be a big hit at the Globe this year. That's Belle's Masters Dissertation sorted. As to the boating link? The name 'Wand'ring Bark' has nothing to do with dogs and everything to do with the Bard. A quick Google search will provide illumination. I made a pilgrimage up the Erewash Canal at Easter 2008, but low water levels halted progress at Eastwood Lock and I was unable to complete the final mile into the basin at Langley Mill. This frustration has been festering away for 18 months so I grasped an opportunity to lake a look at it on foot during a recent outing with Tilly. We rolled into Langley Mill at 1.30pm one Sunday afternoon, absolutely famished and desperate for food. We hunted high and low for the canal and it took a search on my Blackberry GPS to tell us that access to the canal is to be found from the east, not the west. With increasing desperation I suggested a KFC but was advised by Tilly that "she doesn't do KFC's". What self respecting teeneager trurn up their nose at junk food, I ask you? In the end I gave up on the canal and made for the Great Northern Pub, and was astonished to discover that the rear of the pub overlooks the very bit of water we had been hunting for! It's a fairly basic pub and the sight of a Doc Martin clad landlord with a brace of swallows on his neck gave rise to a measure of caution. I shouldn't have worried - they were lovely and welcoming, providing two huge helpings of roast beef from the carvery plus, a drink each with change from £12! Not bad. With the daylight fading we took a wander round the basin, noting the very pretty toll house which marks the start of the Cromford Canal. Great Northern Basin itself represents the start of the now abandoned Nottingham Canal, which runs alongside the Erewash for a mile or so, before bearing east at Eastwood Lock. Why the two canals run parallel is a mystery, but one which will no doubt be answered with a bit of on line research. With the Cromford Canal nearly finished (just the stretch between Ironville and Langley Mill remains unexplored) maybe the Nottingham Canal is the logical next step. Granny has an impact, but it isn't a 'Buttons Bonanza'. It is generally accepted that a mention on Andrew Denny's Granny Buttons blogsite will result in a marked increase in web traffic coming your way. Halfe and Waterlilly have been debating the scale of this impact and figured that it must be worth five or even ten places on the Waterways Ranking. Of course, that depends on your starting point and, as Captain Ahab was riding unusually high in the virtual water over the Christmas period, the extra hits merely served to maintain my position at 25 (ish). I am currently coaching Jeff with his CGSE Maths so I find myself thinking mathematically most of the time. This train of thought prompted an attempt at a mathematical evlauation of the phenomenon known as the Buttons Bonanza. Granny carried an item on my post about Aldborough Mill on the 5th Jan which he then very kindly followed up with a local reaction on the 6th. I have used these two days to measure the impact of referred traffic coming from Granny Buttons and correllated it to the number of hits on the Aldborough Mill item. Whilst the numbers are up, the normal average daily traffic is currently about 55 so it delivered a bonus, but no bonanza. I would therefore suggest that the mathematical formulae for the Buttons Bonanza is (Л x D ∞) with D being the number of additional hits, pie being 3.142. When worked out in full it means that doing this sort of calculation takes one round in circles in an everlasting loop! On a more sane note, this review of referrals to Captian Ahab's Watery Tales does substantiate Andrew's original observation that if you write stuff that interests a local population, they will come and take a look. My recent series on the lost Bentley Canal is a case in point, with my item being picked up by local interest groups and on line newsheets like Walsall's 'Yam Yam', which generated a substantial volume of traffic. At the end of the day I write about the things that interest me, and sometimes these resonate with a wider readership, and sometimes they don't. Oddly, some of my favourite items have hardly been read at all, but that dosn't matter because the main purpose of the Blog is to serve as a record for myself. Mind you, I have made an incredible number of friends along the way (Mr Denny included) which will have a more lasting impact on my life than a temporary Buttons Bonanza.